The Aroma Whisper provides peaceful silence in operation and is a powerful nebulizing diffuser. Looking for a more compact version of the essential oil diffuser then let us direct you to the Aroma Ace. The pump and atomizer are much more compact than with the Aroma-Whisper above and it has all the same variable controls to adjust the output of essential oils. 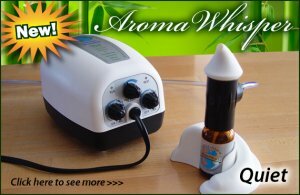 Aroma Whisper has variable user controls and is durable for many years of use. Powerful dispersion of essential oils along with extremely silent operation is the key advantage point to this nebulizer.